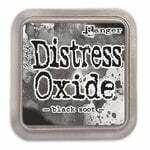 Add fiery color to your stamping projects with the Tim Holtz One Mini Kit Distress Archival Ink Pads by Ranger Ink. 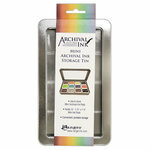 Included in the package are 4 mini archival ink pads that are waterproof, acid-free dye inks. Colors included are Picked Raspberry, Barn Door, Spiced Marmalade and Fossilized Amber. Each pad measures 1.25" x 1.75" and is made in the USA. 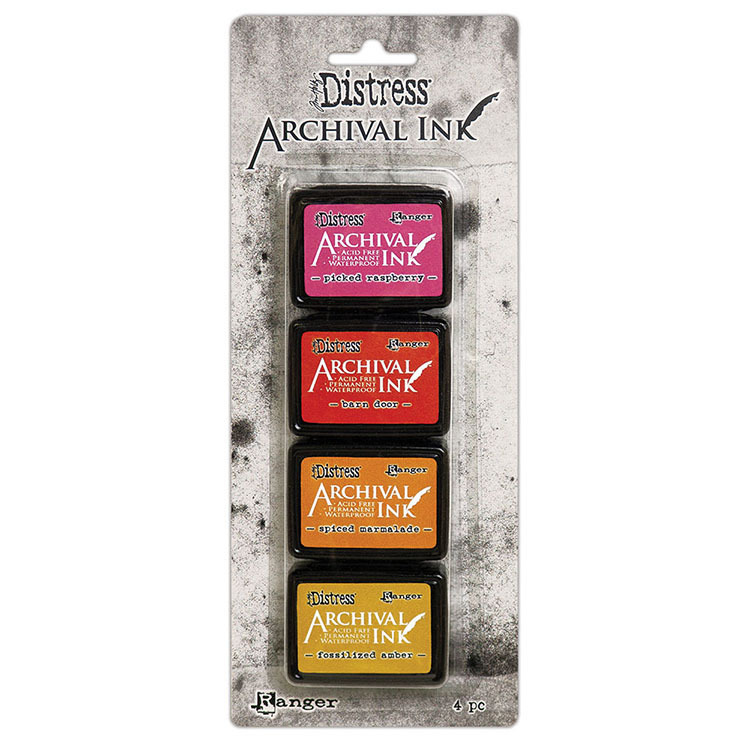 I don't get the difference between Distress Ink and Distress Archival Ink. Is it just the waterproof quality of Archival? 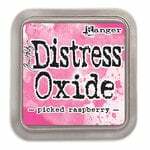 I've bought all the Distress and now all the Distress Oxides, and nearly all the alcohol inks. I'm having a hard time justifying Archival. Thanks By: User (19-Feb-19) Helpful Question? Yes | No Thank you! Report Inappropriate This question has been reported. Thank you! 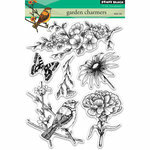 I find the distress archival inks to be great for stamping images, as they give much sharper and defined results. 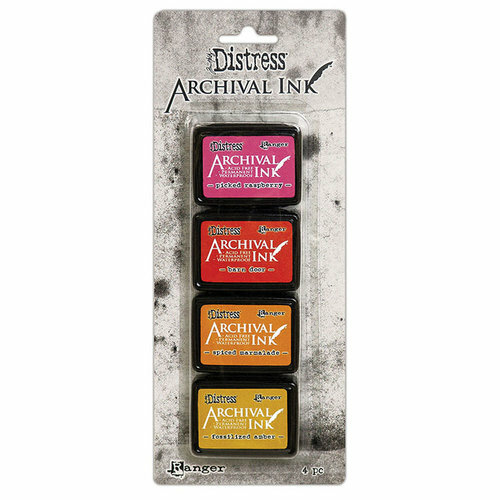 The regular distress inks are, in my opinion, best for adding color but not for image stamping. By: yarngirl35 (25-Mar-19) Helpful Answer? Yes | No Thank you! Report Inappropriate This Answer has been reported. Thank you! I purchased these because I want a permanent ink, in Distress colors, that would stamp over or under the Oxides. By: Sundaystamper (22-Feb-19) Helpful Answer? Yes | No Thank you! Report Inappropriate This Answer has been reported. Thank you! 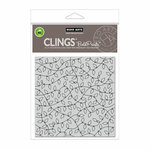 if these are oil, how do you clean off the stamp when they are used for stamping? By: User (20-Feb-19) Helpful Question? Yes | No Thank you! Report Inappropriate This question has been reported. Thank you! I use a damp shammy or, when needed, I spray my stamp with a water based cleaner and rub into a stamp cleaning pad. By: yarngirl35 (25-Mar-19) Helpful Answer? Yes | No Thank you! Report Inappropriate This Answer has been reported. Thank you! Hand sanitizer By: salwolf44 (22-Feb-19) Helpful Answer? Yes | No Thank you! Report Inappropriate This Answer has been reported. Thank you!